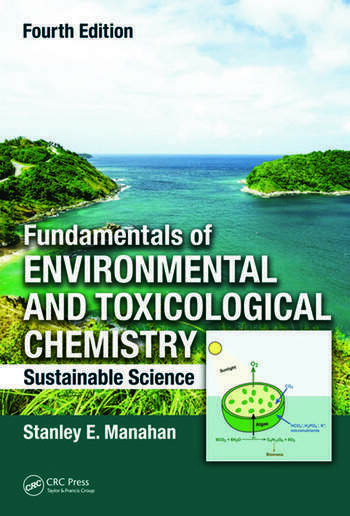 Fundamentals of Environmental and Toxicological Chemistry: Sustainable Science, Fourth Edition covers university-level environmental chemistry, with toxicological chemistry integrated throughout the book. This new edition of a bestseller provides an updated text with an increased emphasis on sustainability and green chemistry. It is organized based on the five spheres of Earth’s environment: (1) the hydrosphere (water), (2) the atmosphere (air), (3) the geosphere (solid Earth), (4) the biosphere (life), and (5) the anthrosphere (the part of the environment made and used by humans). The first chapter defines environmental chemistry and each of the five environmental spheres. The second chapter presents the basics of toxicological chemistry and its relationship to environmental chemistry. Subsequent chapters are grouped by sphere, beginning with the hydrosphere and its environmental chemistry, water pollution, sustainability, and water as nature’s most renewable resource. Chapters then describe the atmosphere, its structure and importance for protecting life on Earth, air pollutants, and the sustainability of atmospheric quality. The author explains the nature of the geosphere and discusses soil for growing food as well as geosphere sustainability. He also describes the biosphere and its sustainability. The final sphere described is the anthrosphere. The text explains human influence on the environment, including climate, pollution in and by the anthrosphere, and means of sustaining this sphere. It also discusses renewable, nonpolluting energy and introduces workplace monitoring. For readers needing additional basic chemistry background, the book includes two chapters on general chemistry and organic chemistry. This updated edition includes three new chapters, new examples and figures, and many new homework problems. Have You Thanked a Clod Today? Stanley E. Manahan is a professor emeritus of chemistry at the University of Missouri-Columbia, where he has been on the faculty since 1965. He earned his AB in chemistry from Emporia State University in Kansas in 1960 and his Ph.D. in analytical chemistry from the University of Kansas in 1965. Since 1968, his primary research and professional activities have been in environmental chemistry, with recent emphasis on hazardous waste treatment. His latest research involves the gasification of wastes and sewage sludge and crop by-product biomass for energy production. Dr. Manahan has taught courses on environmental chemistry, hazardous wastes, toxicological chemistry, and analytical chemistry and has lectured on these topics throughout the United States as an American Chemical Society Local Sections tour speaker and in a number of countries, including France, Italy, Austria, Japan, Mexico, and Venezuela. He has written books on environmental chemistry, green chemistry, water chemistry, energy, general chemistry, environmental geology, the Anthropocene, climate change, environmental science, hazardous wastes and industrial ecology, toxicological chemistry, applied chemistry, and quantitative chemical analysis. Dr. Manahan is the author or coauthor of approximately 90 research articles.